The Lewistown Public Library is pleased to announce bestselling author Mark Sullivan as the speaker for the 2018 Annual Author Dinner. Mark Sullivan is the acclaimed author of eighteen novels, including the #1 New York Times bestselling Private series, which he writes with James Patterson. Mark has received numerous awards for his writing, including the WHSmith Fresh Talent Award, and his works have been names a New York Times Notable Book and a Los Angeles Times Best Book of the year. He grew up in Medfield, Massachusetts, and graduated from Hamilton College with a BA in English before working as a volunteer in the Peace Corps in Niger, West Africa. Upon his return to the United States, he earned a graduate degree from the Medill School of Journalism at Northwestern University and began a career in investigative journalism. As a young boy, Mark had been an avid reader who’d dreamed of becoming a novelist. At the age of 30, he panicked at the thought that he might not follow through on his childhood dream. So, he began writing fiction in his little spare time and soon had short stories published in various literary journals. Mark’s true breakout as a novelist occurred in 1996 with his publication of The Purification Ceremony, which was a finalist for the Edgar Allen Poe award and named one of the best books of the year by the Los Angeles Times. His subsequent novels have been optioned for film, translated into dozens of languages, and graced international bestseller lists. In 2011, Mark began working with legendary thriller author James Patterson. Since then they have written five #1 New York Times Bestsellers including Private Paris, Private L.A., and Private Berlin. Mark lives in southwest Montana with his wife, Betsy. He is an avid skier, sportsman, martial artist and devotee of Crossfit training. As a speaker for the Author Dinner, Mark will be discussing his latest book, Beneath a Scarlet Sky with a presentation titled, “An Italian WWII Story of Jewish Rescue: Pino Lella, Teenage Spy.” Based on the true story of a forgotten hero, Beneath a Scarlet Sky is the triumphant, epic tale of one young man’s incredible courage and resilience during one of history’s darkest hours. New York Times bestselling author Tess Gerritson, says, “Action, adventure, love, war, and an epic hero —all set against the backdrop of one of history’s darkest moments—Mark Sullivan’s Beneath a Scarlet Sky has everything one can ask for in an exceptional World War II novel.” Beneath a Scarlet Sky is a #1 Amazon Charts Most Read and Most Sold Book and a Wall Street Journal and USA Today bestseller. The 8th Annual Author Dinner will be Wednesday, May 16, 2018. 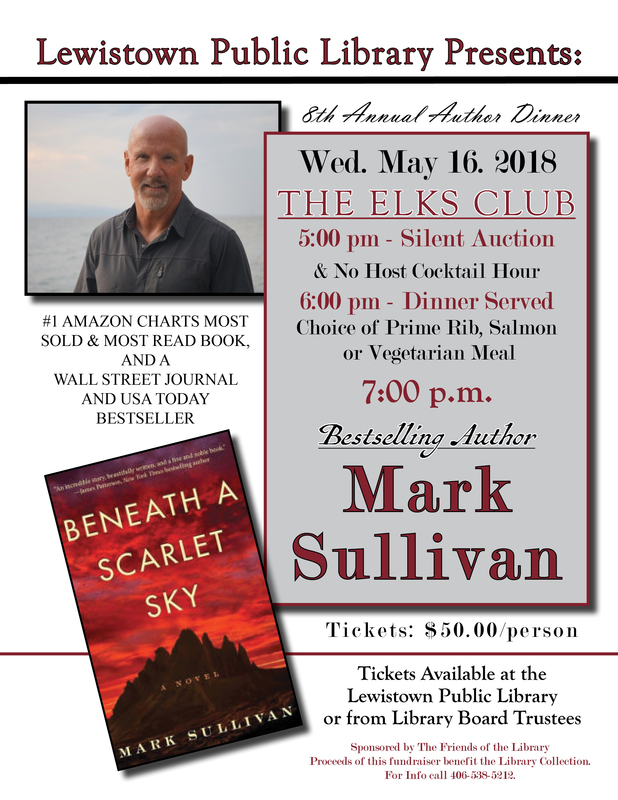 The event will be held at the Elk’s Club and will feature a silent auction, a delicious dinner, and a presentation by Mark Sullivan. This event is a fundraiser for the Lewistown Public Library. Tickets go on sale April 2, 2018 and will be available at the Library or from any Library Board Trustee. The event is sponsored by the Friends of the Library and the Library Board of Trustees. For more information please go to www.lewistownlibrary.org or call 538-5212.